Offerchat.com, a premium live chat provider for eCommerce, is currently running a Facebook giveaway contest that will give away five (5) T-shirts to selected lucky winners. The contest aims to promote Offerchat.com as not only a web development hub but also a design hub. Holding giveaways are a business’ way of promoting their products and services but not Offerchat. Launching a t-shirt giveaway contest is the live chat provider’s way of showing off its great design team and their works – extending to T-shirts and soon tumblers. The ongoing giveaway contest has already gained momentum with more than a hundred signups to win Limited Edition of Offerchat T-shirts designed by the company’s Graphic Designer, Joshua Ragasajo. With the retro look and feel of the tee, many have expressed appreciation and desire to own and flaunt such prize. Offerchat will randomly select five (5) winners from the entrants to receive an Offerchat t-shirt. Winners will be notified via email and announced on the blog http://www.offerchat.com/blog on August 10, 2013. 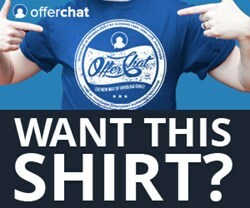 The T-shirt design is only one among the many proofs of Offerchat’s creative designs. The recent redesign of the website received quite a lot of positive feedback from users. Professional, cool and user-friendly are words people used to describe the new design by Web Designer, Reina Figuracion. eCommerce stores mean serious business requiring a partner that is professional and offers flexibility, which Offerchat.com delivers just right. However, customer delight comes when you offer value and fun at the same time evident by its ongoing T-shirt giveaway contest, which owes its success to its design. To learn more about live chat for eCommerce and a quick look at the redesign, visit http://www.offerchat.com. Offerchat is a free premium live chat for websites specifically designed to help online businesses increase their conversions and sales. It is easy to add chat widget with full features that’s 100% free. Offerchat is brewed to perfection at Click Labs, Inc. a company based in Cebu City, Philippines. The company specializes in driving search marketing and social media traffic, social web app development and conversion optimization. Each product or service specifically helps small/medium website owners increase online visibility and improve online sales.